Can AI Really Result in Effective Digital Marketing? Digital marketers always fantasize about the use of AI in Digital marketing. There was an idea, of making a machine learning as a human. With multiple Sci-fi movies in the late 90s, human fantasizes artificial intelligence. That fantasy turned into an obsession and with a few years, the distant view becomes much clear. With the Google’s RankBrain update, it is quite clear that AI will have an impact on the realm of digital marketing. Use of an algorithm which is inspired by AI was a clear sign that one day it shall rule the empire of digital marketers. Are you afraid of Sky-Net or iRobot repeating all over again? Well, you should not coz there are only positive results awaiting (And those movies are just for fun!!!). No machine can rise above us so relax!!! According to QuanticMind, over 97% of influencers believe that the future of digital marketing lays in the future prospects of machine learning and AI-powered automation. 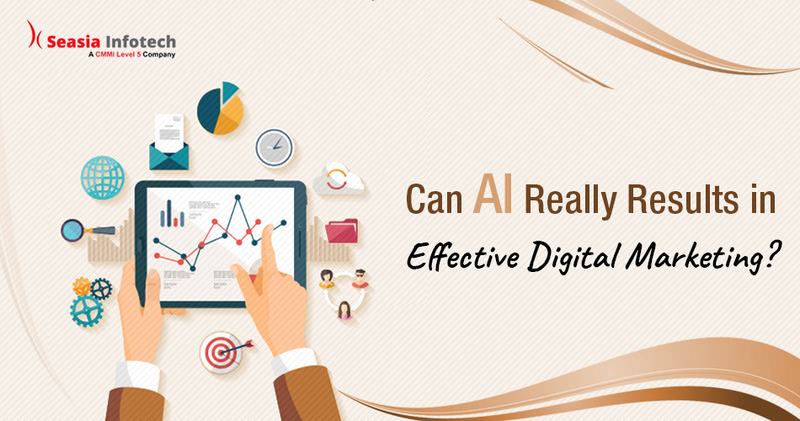 Here in this post, we will try to figure out how exactly AI is impacting digital marketing and what are the future whereabouts of the amalgamation of automation and digital marketing. The Impact of AI in Digital Marketing till Now!!! It is safe to say that Machine learning’s advance applications are still unknown in the realm of digital marketing. However, the applications are quite explicit. There are many tools (which utilizes machine learning), to analyze a large set of data and to present them in an understandable analysis which can be used by the digital marketers to gain new insights without any extra efforts. That time can be utilized by them in understanding the target audience better and they can focus on how to interact with them in effective ways. According to a Gartner report, by 2020, over 85% of customer interactions will be managed without involving any human being. If you are afraid that the machine learning applications will replace you as a digital marketer, then you are on the wrong foot. They are there to ease your work; they will not pose any threat. Also, by using these ML tools, you will be able to streamline your digital marketing strategies. How is Machine Learning implemented in Digital Marketing? If you talk about current trends, using machine learning for digital marketing is certainly one of them. 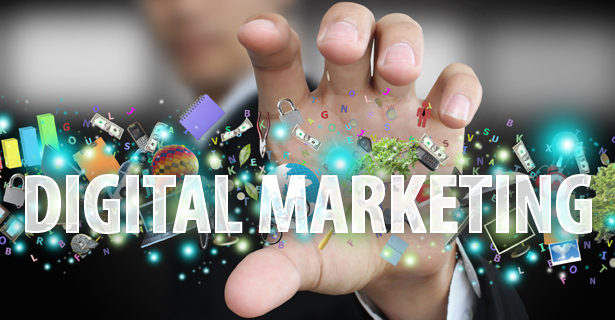 There are many benefits when digital marketing is associated with the ML tools. Increase in productivity is one of them. When you utilize online channels, content, and other data with the help of ML tools, processing this analytic is fast and accurate resulting in increased productivity. Still, you may be baffling about how ML tools can be used in the process of digital marketing. Let’s address this question in a separate section. Content is King is an old saying but it really stands for what it meant. In the recent years, many content marketers, bloggers, and digital marketers voraciously create content to effectively engage their audience and build the brand. Due to their efforts, the content is everywhere online in the form of blogs, informative posts, webinars, images, videos, and other forms of content. With the help of an apt ML tool, as a content marketer, you can understand this data more deeply. It allows you to concentrate on your core work more and less in the data analysis (which is indeed a time-consuming task). The effectiveness of PPC campaign mostly depends on the accuracy of the data analysis which is quite gigantic in amount. There is a saying in PPC campaign which states that a data will be easier to contemplate when the amount is big enough. The use of ML tools can rally up the workforce. Here are the ways by which you can level-up your PPC campaigns with the help of AI and machine learning tools. You will easily get the figures you need to elevate your business. Based on top performance drivers, you can make efficient and long-term strategic decisions. Meeting PPC goals will be easier with ML tool’s deep data analysis. When Google introduced RankBrain algorithm, the application of AI justified that it can be used in serving relevant resources to the audience. AI can also be used in defining the quality of content. Focusing only on keywords is old school and must be replaced with high-quality informative content. In the coming future, there are a lot of applications regarding content creation, SEO, and AI. How can these two tenets affect your digital marketing strategy? It is the question of the millennium. You can utilize the potential of machine learning for the processing of complex problems which we often found in analyzing an immense set of data and in creating personalized content for the targeted audience. Artificial intelligence and deep learning can be helpful in developing meaningful conversations by involving the audience with Chatbots. It will enable your marketing team to focus on their core work. With such data analyzing prowess, you can engage with your hyper-targeted audience by uncovering predictive database with the help of Artificial intelligence. When you’re entering the realm of digital marketing, you need to be innovative, voracious learner, and adaptive to all sorts of changes. The online content pool is endless and full of new possibilities. Finding and leveraging those new tenets can give the wings your business always seeks for. Embracing Artificial intelligence is not endangering your job but only increase your efficiency. You and your marketing team can level-up your capabilities and build content which is engaging, inspiring, and advocates meaning corporate relationships. I hope you get what my point is here. Artificial intelligence is for you, it is not replacing you. The machine is invented to increase the efficiency, not replace humans (It can never replace you!!!). Mention your thoughts in the comment section and let me know your valuable thoughts. Adios, for now, fellas and have a good day ahead of you. How Can Instagram Stories Help You Win Followers? Are you sure that you’re getting the maximum out of your Instagram stories? Ever experienced the boost in the numbers and engagement after posting, your countdown offers, behind-the-scene photos, and the 10-second videos? Well, this all sounds terrific, but if you aren’t doing this yet, don’t fear – we have some tips and encouragement that can either get you started or amplify whatever you are doing. And the best part is, smaller businesses can take advantage of Instagram stories in better ways than how grander businesses cannot. 1. It’s easier for you. The splendor of Instagram Stories is that you can create quick photos and videos that don’t have to compete the quality of those in your eternal feed. You can let your customers see behind the magic curtain, without having to answer to the administrators in the office corner. • Snap videos that give a virtual tour of your new office – including the Minion bobble heads on your desk. • Show a candid of your data analyst engrossed in numbers, working away next to a ridiculously gigantic cup of coffee. • Post a live coverage of a significant event. • Post a photo or a video of your team participating in local charity initiatives. • Shoot a few seconds of your quirkiest employees celebrating a product launch. With the casual nature of these stories, your followers won’t really expect much of your post to be a black tie affair. You can save your best, artiest captures for your main feed. You can share your stories to allow you to continually share content about your business fun side- human side- and that makes you all the more loveable to your prospects and existing customers. 2. You can use it to test new content. Bigger businesses test everything. Got an inkling for a new product? Great! Bigger businesses test it in theory, and in house. They beta test it with a selected few and then A/B test it in the market. After all this, they wait to see if it brings in enough profit. But you don’t have to settle for this hassle. You have a new idea; think what your customer base might think of it. Or about the new theme, color, function, feature, service, approach, etc. Stick it in your Stories. See which ones get more views or shares. If it’s a flop, it will anyway be over by the next day. And if certain content performs well in the stories, then you can obviously roll it out in the main feed or adapt it for other channels. 3. Your offers and contests will be more enticing. An expiry date communicates exclusivity and urgency. Communicate to your spectators that you reward the most intent, loyal followers by allowing them to get the opportunity on your next contest, game, etc., because they were paying attention to your Story of the day. And you can also test the efficacy of your contest and offers with Stories as well. Which type of offer did your followers favored the most? Pre-orders? Sneak peak? Contests? Discounts? You will find out soon. As the time goes on, more and more of these time-sensitive offers you create, more your followers will make it a habit to check your profile constantly. 4. Your audience will grow in loyalty. People feel privileged to exclusive information. They also like to make real connections. As they get to know your business’s Stories, delight the behind-the-scenes sneaks-peeks of your team, your process, your priorities, they will keep coming back for more. With each Story you share, you give your followers several chances to resonate with you, learn that the same reasons they do business or support your cause is because you are just like them. That is the loyalty money can’t buy, but Stories can. 5. Your audience will grow in number. Question to any digital marketing service provider and you’ll get to learn – just as your current audience gets engaged, the number of your followers will increase as well. Especially if you are already using Instagram, you are likely already doing tactics to increase followers, such as optimizing hashtags, liking and commenting on a post of your target audience, holding contests, and a lot more. And as your existing followers keep viewing and sharing your Stories, others will notice as well. Additionally, by utilizing the Stories along with your existing Instagram activity, these two feeds can reach different demographics at the same time on the same social media platform. Stories, like Snapchat, typically cater to the viewing habits of a younger audience, who are constantly on their smartphones and watching their notifications. Meanwhile, more ‘seasoned’ users will still be springing to Your Business train because they can assess more of their favorite content from you without having a new platform to learn. 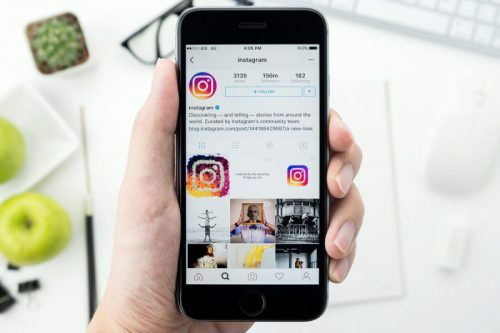 All things considered, if you have got more messages to share with your audience, Instagram Stories are an ideal method for you that doesn’t have layers of corporate or bureaucrat rings to jump through. You can afford to be personal, direct, and a bit risky too. And, if nothing else, it is the perfect place to try and see how things work. A low stake avenue to test, connect, and engage is indeed at your fingertips. Success on Twitter is associated with strategic thinking on how to leverage Twitter as a part of your comprehensive online marketing and social media efforts. Twitter is no more about collecting a herd of followers, but about engagement, likes and retweets! It is an intimidating social platform, with so much noise and so many experts on every topic known to man. Though it may seem that you need some cultured strategies to dominate on Twitter, but if you ace some simple strategies, you can knock into a community of compatible followers who will drive traffic to your website and support your efforts. If you have built a hefty following, but are struggling to engage with them, it is your capability to not knowing your followers. Concentrate your effort and time in understanding your existing followers and engage with them effectively, rather than chasing the new ones. You can also make use of the excellent audience tracker tool Followerwonk by Moz. It helps in giving you an idea of who is tracking your activities. While most of the features are available for free, its premium version comes with additional features that can track all your account followers. One of its finest features is the word cloud that generates visualizing keywords from your audiences’ bio, helping you in finding the common denominators among your followers and understanding them. You can also track the most active timings of your audience and schedule tweets when the highest numbers of followers are active. Once aware of your followers, you can change your content accordingly. Serve them some engaging, unique and enlightening content according to their taste. Use your social media accounts to drive them to your content, hence starting a complete planned inbound marketing. Don’t just self-promote yourself, see what’s trending and plunge into discussions. You can also share content from others that may please the palate of your followers – you can spin on the story or link the original trusty source. Twitter is a platform that encourages crisp and to-the-point content, prompting to readers to quote and respond to your tweet. According to research by Buffer, the ideal length of a tweet ranges from 71 to 100 characters, despite the fact that the limit by Twitter is up to 140 characters. So keep it sweet, short and snappy. In a text dominated Twitter stream, a tweet together with an image will surely stand out. A graphically pleasing post is sure to get more likes, retweets, and earn followers. Even adding text to a simple image can be really effective. You can find high quality images at Flickr, Unsplash or purchase a subscription for Shutterstock, iStock, Thinkstock, or Dreamstime. Using high quality images brings more attention to your post than unadorned text. We know that hashtags get more coverage to your tweets, but a lot of us often overuse this feature. However, to get the right coverage and expand your audience, you just need the right hashtag. You can learn and discover about the most popular hashtags and the ones that can connect you to your target audience at Hashtags.org or Ritetag.com. Make sure that you pay attention to the hashtags that your influences are using. This way, you can utilize the same ones to meet the right audience. Using one or two hashtags can get you the desired results, provided that they are the best suited ones! Twitter video is undeniably the most underused feature that can win you bonus on engagement you create. Living in a visual world, we all fall for videos for the fact that the information they provide is compact and being backed by the audios and visuals, the information becomes much easier to take in. Not worth mentioning, you can convey much more in a video that in 140 characters (which includes the spaces). Even a 30 second video can make your account seem more personal and reliable. You can give them a sneak peak of your work life, or short clips from a live event to create a tinkle. Don’t hesitate to use the external sources to enrich your account and share prominent content. Include the author of the article you are linking, or the company or brand involved, in order to get a mention or a retweet. Follow the same rule when including social influences in your field, the popular, prominent people with huge followings. A retweet or mention by the right person can get carried far afield. This can help create thousands of impressions, but is another tactic that you shouldn’t be exploited much. Remember, balance is the key. Overusing this can overpower your references. So, what are you waiting for? You can DIY these tactics or hire our team of digital marketing consultants to upkeep your online presence. We all know the importance of regular blogging for your business. But then coming up with new and valuable topics to post about every single day can be really difficult and time-consuming. Rather, 60% of the marketers say that creating engaging content is among the biggest challenges in 2016. One way to simplify the process of consistent blog content creation is to repurpose the old posts to new formats. The Pareto principle states that 80% of the effects come from the 20% of the cases, where 20% of your posts bring in 80% of your organic traffic. That is to say that you don’t need to reinvent the wheel. Rather than writing spanking new, content every day, you can make use of the hundreds of old posts by renovating, combining and repurposing them. Although the specific repurposing techniques would still require some effort on your part, they wouldn’t be really time-consuming as the ideation, research and drafting of articles based on the new topics. Many digital market expert India believes that besides saving time, by updating and republishing the old content on your website, you can increase your organic traffic further. You will have a greater chance of older blog posts ranking better than the brand new posts. Technology moves really fast, with the websites, products and services disappearing as fast as the new ones emerge to replace them. Reexamining your perennial posts every year or two not only keeps them in the vanguard, but also increase the organic traffic. Let’s suppose you run a digital marketing blog. You’d know how quickly information, algorithms and techniques change, which means that the recommendations that you shared would also change. • Add a line at the top of the post to announce the update. Use can use ‘2nd Edition’, ‘Updated’, ‘Now with More’ or ‘Updated to Include More’. • If using a WordPress post, you can simply change the publish date to today’s date and update it once all your changes are made. • Use the same old URL instead of creating a new one. P.S: These tips ensure that you don’t lose your ranking for the post. Videos have turned out as the most popular online medium for consuming content in no time. According to Google, YouTube explains that annual mobile video consumption has increased by more than 100%. 100 million hours of videos are watched on social media daily and it is expected that 79% of the internet traffic will come from videos by the year 2018. • Create screen capture videos that show you carrying out different tasks and procedures described in the past blog and articles. • Record yourself an ad-lib on the topics covered in the blog posts. If you are comfortable with it, even a conversational video on the past topics can come across as more natural for the viewers. • Consider exploring the live-streaming world. However, it can be a little terrifying until you get used to it. • You can also create animated videos using text, photos, music, video clips and sound effects. It proves to be a great choice for the camera-shy people in your team. Whatever approach you decide, publish your new video blog post to your own website and then upload it to YouTube (and/or on other video sharing sites) to see the expanded reach of your ‘New and Improved’ content. If you run a podcast, look to your old content to provide inspiration for the future audio episodes. Podcasting is a tremendously popular medium, and it is getting bigger and bigger. And with the fast growing use of smartphones, the podcast audience is only going to get bigger. You can either record reading the articles word-for-word yourself, or can use the past blogs as an inspiration for your podcast episodes to avoid turning off the listeners with a stiff delivery style. If you think that people don’t really read emails, then you are definitely lagging on something. What your potential customers aren’t really interested in are the promotional emails from you. But they would never negate something of value, if that entertains them, teaches them something new or helps them in one or the other way. You can post your blogs ‘as it is’ into individual newsletter issues, or use the pared down version, or simple prompts to redirect the readers back to the original posts. If they haven’t seen it earlier, its new to them! If you have a selection of the past blog posts based around the same theme, then you can consider releasing the newsletter as a series of posts. Let’s suppose, if you have 5 different articles discussing link building techniques, then you can put them all altogether and advertise your newsletter as an e-course for ‘5 weeks to Link Building Success’. Binding posts together in this way make the readers more likely to come back week after week, as compared to ‘one off’ messages. The best way to figure out the working of a new platform is by familiarizing the existing content to it. Since you already know the type of response a particular blog has generated, you can see whether you are able to replicate a similar response through an emerging platform. Snapchat has become one of the leading social networks out there in no time, but it is still early enough for the marketers to see significant ROI because only 1% of the advertisers are using Snapchat for marketing. You can also repurpose any strategies that you teach or discuss in your blog posts into bite-sized Snapchat stories. To make an eBook out of the old blog posts, look for a series of at least 10 blogs based around a similar theme, bring them together in a way that makes sense, and write any additional test required to make it a more solid read. You can offer your eBook as an incentive to encourage the new readers to join your email marketing list. This will prove to be extremely cost effective. Rather than having your fans reading 10 different blog posts, you can make available to your readers in a convenient, downloadable PDF with an elaborated cover and a bit of extra content that attracts people. The eBook can also be used as a content upgrade or a lead magnet for the other posts, which is an excellent way to convert your readers into subscribers. One final alternate to consider for repurposing your old blog content is to pile up several past posts into one ‘best of’ article. Suppose, you had a series of articles that didn’t perform as you hoped they would, then sharing them again in a new format may bring about your desired level of recognition. But irrespective of what type of repurposing you decide to use, there is one thing to bear in mind: Bloggers fear that repurposing the old content will bore the current readers or will run the risk of seeming monotonous, this hardly happens. A very few visitors would have read every piece of content on your website. This makes your repurposing more of a welcoming introduction to the past articles they have missed, and not an unwanted promotion of the already seen content. Infographics are the new slide decks! In fact, they are liked 4 times more than the traditional presentations on portals, and have shared 3 times more than any other content on social media. In addition to this, 65% of the marketing executives believe that infographics and the similar visual content communicate their brand story better than just text. They appeal more to our visual brains and don’t require too much of our short attention spans. Almost everything can be converted to an infographic, but it does work better with the statistic and heavy duty content pieces. Remember that this format is visual, so ask yourself if the information can be conveyed with numbers, images or other statistics. If not, you should probably just write a blog post or create a video tutorial. • Take time to think about what look you want for the information and how it represents your brand. You can take the help of a designer or can Do-It-Yourself! Beyond these cases, be conscious of the fact that people like to abstract content in different formats. What might seem like a long, overpowering text post could come across as much more handy in video format, depending on the unique preferences of your readers’. In this situation, you are not being repetitive – you are actually introducing your message to reach a greater number of customers. Consider the above described techniques as a way to strengthen your message and minimize the amount of effort needed to run a successful business blog. Marketing on the Internet is no small feat. If you’ve any doubt about this, then you may even ask many small and medium business owners who have deserted the idea of online marketing because they were outflowing their hard earned money without observing any results from their online promotion campaigns. But, at the same time, there are lots of ecommerce stores and small businesses that are quietly generating decent earnings only from their digital marketing efforts. Whether you are responsible for the marketing strategies for a business or you own a business, you certainly understand the significance of a digital marketing strategy. 1. The very first step of every digital marketing campaign is to recognize your target audience and determining the digital platforms they are using. Reach to your target audience and make it simple for them to find you. Online: It is possible to reach your potential and current customers with the help of targeted advertising and re-targeting. Through online marketing campaigns you can strengthen your brand, provide special offers and educate your audience (in terms of your services and what value you bring. Social: Pick out the platforms that are compatible with your overall business goal and brand voice e.g. Facebook, Twitter, Pinterest, Google+ and Instagram etc. Mobile: Never underestimate the significance of mobile platforms. Mobile usage is high and is continually rising. Overlooking mobile platforms is a huge missed opportunity. SEM/SEO: Search Engine Optimization is a marketing restraint intensive on rising visibility in search engine results. Make it as simple as possible for those who are looking for your service or product to discover you through paid or organic search on the most popular search engines like Google, Bing and Yahoo. 2. It is vital to educate your audience, offer value and establish a relationship with them. Always reward your loyal audiences by providing them beneficial information and incentives to use your service or product. Make A Blog: Sharing helpful information, tips & tricks with your audience will help then to find out that you are a reliable source for information regarding the product or service that you are providing. If they find you trustworthy, they will be more likely to come back to you when it is the time to buy. Social Personas: Undoubtedly, social platforms give the business a special edge and encourages communication. Two way interaction makes your audience feel connected to you in a manner that traditional advertising cannot do. Email Campaigns: Establishing constant communication with your audience gives you an opportunity to share unique offers and valuable information. Web Presence: It is vital to ensure that your website precisely symbolizes your business and the value you bring to your customers. At the same time make sure your website is indexed in search engines (Google, Bing & Yahoo etc.). If people cannot find your site, then how will they know your value? 3. Lastly, and perhaps most importantly, create measurable & clear digital goals that line up with overall business goals and are traceable, as this will make ROI measurement more achievable. Google Analytics: With Google Analytics, you can track website URL, identify & quantify traffic patterns and referring sources for free. However, many other companies offer paid services like Omniture, Webtrends and Adobe that provide more detailed reporting. Facebook Analytics: Tracking user engagement, likes, followers, post shares and total reach helps to easily scale the efficiency of your Facebook interactions. Sprout Social: These tools integrate metrics from various social platforms and display them in an easy to understand layout. While planning your digital marketing strategy, always make sure to focus on your audience. Discover your current & potential audience and give them an incentive or some really worthy information to keep in touch with you. At the same time make sure you can measure all of your digital marketing efforts. Following above mentioned tactics will help your business grow and will help strengthen the bonding with your audience.